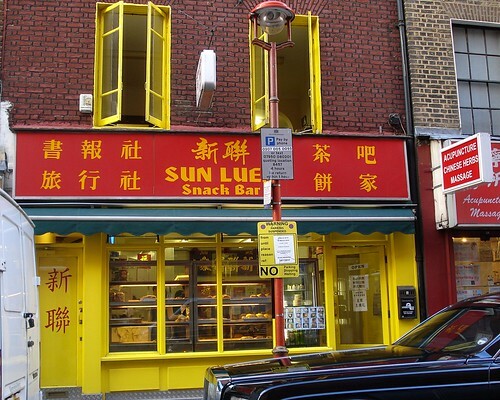 This week's featured article is for Sun Luen Snack Bar in Chinatown, which sounds like a nice quiet place for a breather (and an egg tart) in the centre of town. A bunch of new articles have appeared! There's a branch of the Franco Manca pizza chain in Wimbledon; long-established dining spot Joanna's in Crystal Palace; the organisationally-challenged Tartine Artisan cafe, and Lebanese restaurant Meza, both in Tooting Broadway. The Bond Street branch of Rasa has had an update following a visit, by me! Spoiler: it's still great, and you should all go. Lastly, after what seems like aeons, the Waterloo Tap is finally open, and ready to sell you some craft beer. 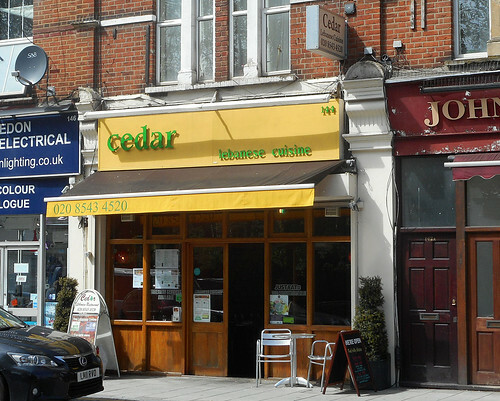 This week's featured article is for Finger Licking, CR0 2RB, a small Ghanaian restaurant close to West Croydon Station. They do takeaway boxes that may or may not include tripe, according to your tripe preference! Three new articles this week, all for restaurants: Panda in Leytonstone specialises in dim sum with some Sichuan dishes too, while Abuja Connection in Crystal Palace does some interesting-sounding traditional Nigerian food, including fried plantain, egusi stew and - yes, you've guessed it - tripe! Although on their last visit our intrepid reporters preferred the chicken instead. Fischer's in Marylebone is a shiny new Viennese 'cafe' that would love you to believe it was still the 1930s. It's certainly a pleasant environment in which to tuck into your schnitzel*, and most importantly, my Mum likes it a lot. There are a few pub updates following recent visits: the Postal Order Wetherspoons in Crystal Palace, the Trafalgar in South Wimbledon (which has had a revamp for the better) and Birkbeck Tavern in Leyton. Finally, the Capitol Wetherspoons in Forest Hill is set to close, although exactly when this will happen is still a mystery. *I spent at least ten minutes trying to find a pun here and failed - jokes about Austrian food are the würst. 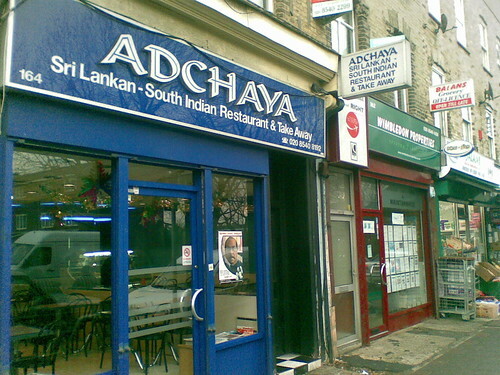 This week's featured article is Adchaya, SW19 1AZ, a Sri Lankan canteen-style restaurant in Wimbledon, that serves large filling meals for £5, and plenty of spicy food. It also has some excellent South Indian dishes too. One new article is Brasserie Rayon d'Or, a bar/restaurant in Croydon where it looks like you can just get a drink if you want, probably the best you can hope for a place named after synthetic fabric (PS it's not really). The reported closure is Cafe Naz, a Bangladeshi restaurant on Brick Lane, which may only be closing temporarily (we're not sure). It also seems as if The Captain's Cabin just off Haymarket has closed, but we haven't verified this, and would appreciate more info. Good afternoon RGLers! After last week's mega-pub-update, we're turning our attention to restaurants this week. 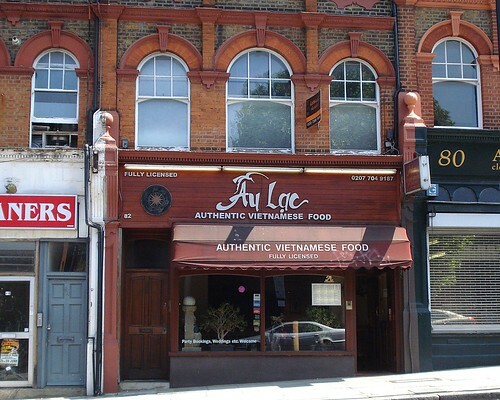 Our featured article is for Au Lac, N5 2XE, a reasonably-priced Vietnamese restaurant in Highbury. Their fish sounds very tempting, especially the Tilapia - awesome little dudes who are also a natural alternative to pesticides, as they eat algae and malaria-carrying mosquito larvae. Though I'd expect that the pest-eating fishes are probably not the same fishes that will end up on your plate. For non-piscine fans there are a whole bunch of veggie options too, including sizzling aubergines! 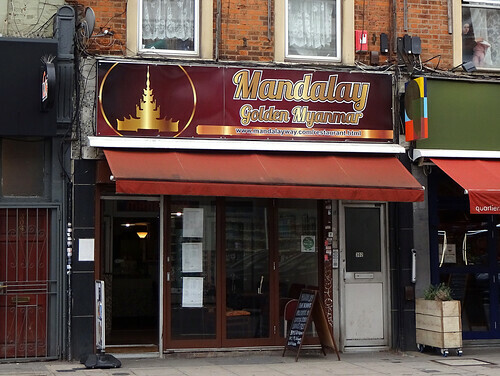 Two other restaurants have been added to RGL: Priya in East Ham, specialising in South Indian and Sri Lankan food; and Kibou, a Japanese restaurant in South Wimbledon with decent food and some interesting beers. There are two reported closures as well: Punk bar off Oxford Street (demolished as part of the Crossrail works) and Impress Food Oriental supermarket in Bayswater which looks likely to be turning into yet another Sainsbury's (sigh). Hello! 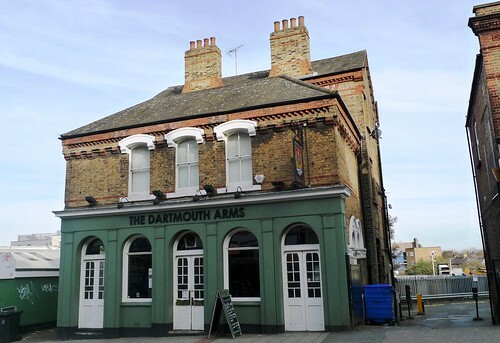 This week's featured article is The Dartmouth Arms, SE23 3HN, a gastropub in Forest Hill with good food and very expensive lime and soda. We have one addition, the Two Brewers in Chigwell, added by my colleague and countryside walker Kat. 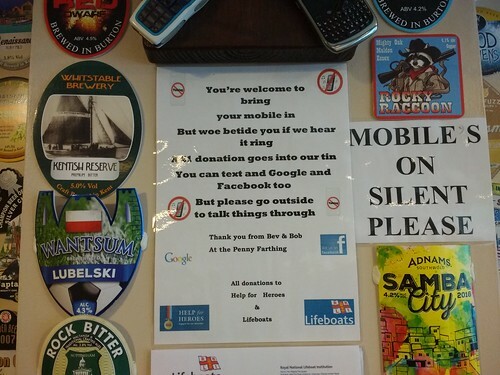 The beer is well-kept and it's all very in keeping with the general area (upmarket Essex), it sounds like. Closures are the Crooked Billet in Barking, as well as various branches of Nicolas wine merchants (branches in Kingston, Putney, Southfields, Fulham, Hampton Hill, Bloomsbury and Norbiton). A number of the remaining Nicolas branches (but not all of them) have been taken over by Spirited Wines and renamed as such. Therefore, there's now a Spirited Wines category. 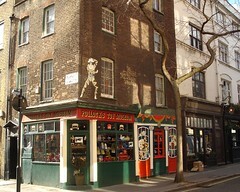 This week's featured article is Pollock's Toy Museum, a museum of toys set in a couple of adjoining terraced houses in Fitzrovia, just off Tottenham Court Road. We have one new addition: Browns of Brockley, a cafe and coffee bar in an area of London you can probably guess. The entry for Loving Hut, a vegan Chinese restaurant in Edgware, has been updated. 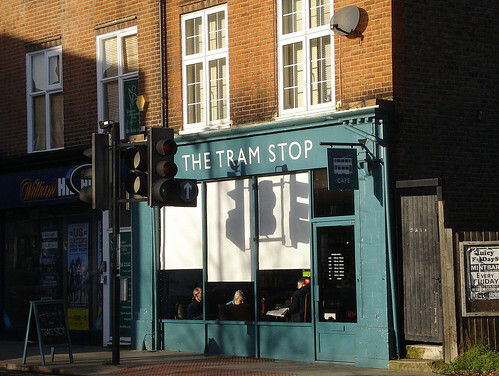 The reported permanent closures are two pubs and two bars: The Brewery Tap in Wimbledon and The Glassy Junction in Southall; Jrink in Soho, and 1802 in Docklands.